Not last Thursday night but the Thursday before, I was sitting in the lounge-room, minding my own business when I heard this noise coming from the kitchen. I got up to investigate and when I got in there it stopped. So I went and sat back down and sure enough the sound started up again. So I crept back to the kitchen and stood in the door listening. The sound was vaguely familiar. I'd heard it before. Not often, but since our neighbours completely cleared the jungle that was previously their backyard, I've heard it more. I didn't have enough nerve to open the door under the sink, where the sound was coming from, but I was pretty sure the world's biggest rat was in the cupboard under the sink, scratching away at something! I did the brave thing and kicked the door of the cupboard and shouted a few "Piss Off" 's at the cupboard and the noise stopped. But again, I was too chicken to open the door for fear this giant, rabid specimen of vermin would come flying out at me with it's fangs bared. 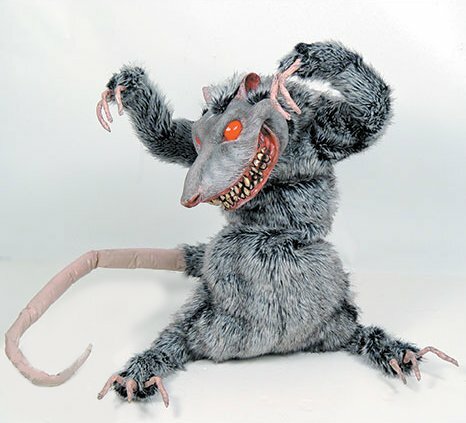 In my mind I know this is what that rat looked like! Don't get me wrong, I'm not one of those girls, that shrieks at the slightest suggestion of a mouse. I don't have a problem with mice. I can handle seeing rats outside in my neighbours yard, I can even tolerate the odd scratching I've heard in the roof every now and then. But what I will not go near, when I'm in the house on my own, in the dead of night, with no back-up and no chance of rescue till morning (I may be going a little overboard here) is a rat in my cupboard, the unseen making it seem even bigger than it was, I'm sure! So on Friday night I told Dave of the sounds and told him to pull the dishwasher out and check the hose before he put a load on the following morning. He just gave me the "mmm hmmm" look, as if to say "Sure I will" and off we went to bed. Of course, the following morning, 10mins into to the dish washing cycle, I hear Dave calling me from the kitchen, and walk in to find water everywhere and more still flowing! The look on poor Dave's face was priceless. His final chore of the morning before he got ready to go to his mate's party, had turned from a quick 5 minute thing to a full on half hour clean-up! Anyway, we got it under control and off we went to the party. We got there about 2pm and I left the boys about 6pm to go home and finish my book, assuring them I'd be back when they were ready to go home. Oh yeah. I know how to party! The following evening, after about 5 hours of sleep (everyone came back to ours after the party, and so I wasn't able to grace my bed with my presence until about 7am!) Dave and I were sitting in the lounge-room, when I heard the rat under the sink again. I asked Dave to go and disconnect the hose all-together (no way was I going near that thing when I knew that rat was close by, just waiting to strike!) and after about a minute I heard this heart-sinking sound. "Please God let that be outside" I prayed. "Kylez, I need you" Dave calls from the kitchen. I walk in and there's Dave, holding the hose over the sink, dripping like a drowned rat (excuse the bad pun), water from one end of the kitchen to the other, and beyond (I found drips in the dining room and one of the bedrooms!) staring at me with the most bewildered look on his face. He's forgotten (in his lack of sleep and hangover stupor) to turn the tap off before he disconnected the hose. I stood in the doorway looking at Dave for a few seconds and then we both just burst out laughing. It was either that or cry. About a million towels and a dry pair of pants later, we sat on the lounge, planning out attack on the Giant, Rabid Vermin. It's been two weeks and our campaign of Shock (traps) and Awe (poison! eek!) seems to be working. While we haven't found any dead rats, I haven't heard any alive rats either. I'm hoping that's a good sign. I sympathise with you Kylie - because i AM one of those girls who panics at the mere suggestion of a mouse! I heard chewed grape bubble yum in a big snap trap works well!